Product information "Car Wrap-to-Go Adventure Tipi, Adventure Tipi"
description & equipment LÄSSIG offers you a car organizer that promises travel adventure without stress! 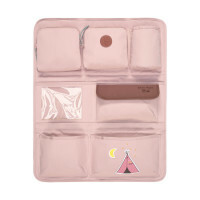 This organizer is from the Adventure Collection – in dusky pink with a tipi, or in blue with a bus. This travel companion with its clear allocation of pockets is virtually indispensable for children and their parents when spending time in the car. Children have what they need at their finger tips, whether it’s a soft animal, drinking bottle, toy or snacks – everything fits into the numerous and practical storage pockets fitted with Velcro fasteners and zippers. It can easily be attached to the back of a car seat. The Car-Wrap-to-Go in the trendy Adventure design – dusky pink with a tipi and in blue with a bus – combines warm earthy shades and yellow color accents. 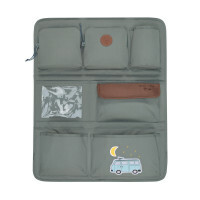 The Car-Wrap-to-Go Organizer is also available in the various designs of LÄSSIG’s other Children’s Collections.